If you’ve fallen out of love with your lips and are desperately dreaming of owning some luscious full bodied beauties, or simply want to put an end to embarrassing lipstick disasters, don’t despair as I’m here to wave my magic hand piece and provide you with a dazzling display of divine colour choices that will resolve your problems once and for all. It’s a well-known fact that as we age our lips get thinner and lose their plumpness and voluptuous volume, due to a slow-down in the production of collagen which is crucial in sustaining our youthful appearance, as it provides a structure for hyaluronic acid and elastin. If you want to own a pair of lips that speak louder than words, whilst avoiding the use of fillers or surgical lip augmentation, then permanent make up is your new secret weapon, due to its ability to add definition and create the illusion of fullness and symmetry, by using technologically advanced pigments that enhance and complement your natural beauty. In addition to the creation of a sensual lip liner we also offer subtle lip blush treatments which involve the application of a sheer natural colouring to the entire lip area which when completed can replace the need to constantly reapply lipstick through the day, as your permanently there gorgeous pout can be enhanced with the simple application of a gloss or moisturising balm. 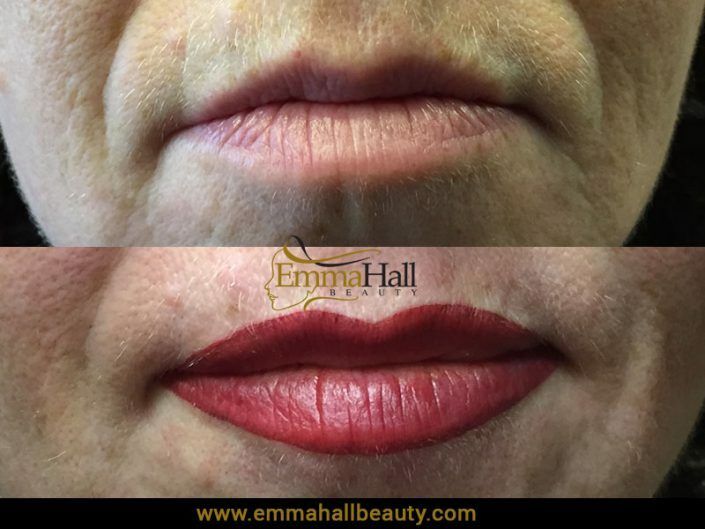 Colour, shape and definition will be addressed in your pre-treatment consultation, in which a replica lip line will be carefully mapped and drawn onto your skin so that you can see exactly what the end result will look like. It’s important to remember that as with all micropigmentation treatments, the chosen colour will at first appear between 40-70% darker than it will be after healing has taken place and the epidermal cells have fully renewed (a process which can take up to 10 days).